1. What is the best way to be in-the-know or to prepare ahead of time? To help our patrons and fans, we recently launched a new BB&T Atlanta Open app, which is available via the App Store and Google Play. The app allows you to purchase tickets, follow your favorite players, get real-time scores and schedules, view the tournament site map, check the weather, and view parking recommendations. 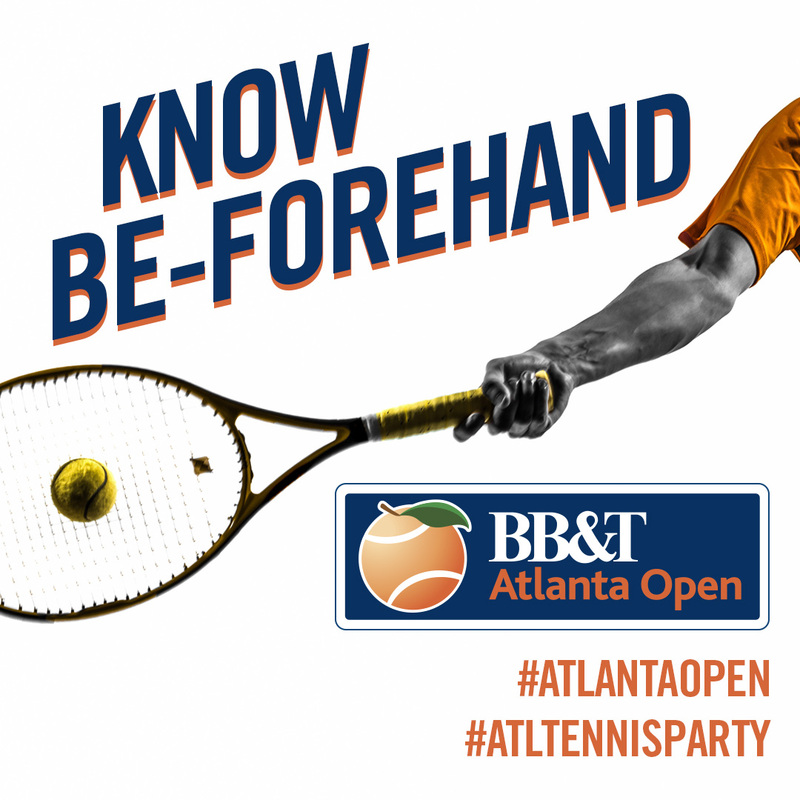 You can also visit www.bbtatlantaopen.com and review the FAQs under “Tournament Information” for any questions you may have. 2. What clothing is recommended and what items can I bring in? Because it is Atlanta in July, light-weight clothing is recommended, along with items to protect you from the sun, including sunglasses and hats. Items that are not allowed include: outside food or beverages (with the exception of 20-ounce or smaller water bottles - one per person - provided they are clear and made of plastic), umbrellas, backpacks or briefcases, or professional cameras or video equipment. Side note: We do allow snapping pictures via your smart phone; in fact, it is encouraged if you plan to share your excitement via your social media channels and tag @bbtatlantaopen (#AtlantaOpen #AtlTennisParty). The AJC Grandstand Court now offers shaded seating, compliments of Northside Hospital. Additionally, for only a $20 upgrade fee ($25 at the box office), you can gain access to the new Champions Club, which offers a private air-conditioned space overlooking our AJC Grandstand Court. This option is limited, so we recommend that tennis fans upgrade to the Champions Club upgrade before the tournament starts. We also recommend taking advantage of the variety of our ice-cold refreshments, including water, ice cream and cocktails, located throughout the tournament site. 4. What’s the easiest way in and out? Parking for the 2018 BB&T Atlanta Open is easy as Atlantic Station offers more than 7,000 parking spots below the site via its parking deck. It's easy to get in and out and you can stay all day for $14, so you not only enjoy world-class tennis, but also the thrills of all of the shops, restaurants and entertainment that Atlantic Station has to offer. VIP parking and Lexus owners will park on 20th Street, behind the Regal Cinemas. If you do not want to drive, Atlantic Station provides regular complimentary shuttles to and from the Arts Center MARTA Station. For Uber and Lyft drop offs, use the address 259 17 ½ Street. 5. Where is the box office located and where do I go to enter the tournament grounds? Take the #4 staircase to (P2 level of the parking deck) for general admission, box office, suite holder entrance and ADA access. The box office/will call is located next to the main entrance, which is on 20th Street at the corner of Fowler Street. The suite holder entrance is on the corner of Market Street and Tower Street. The ADA entrance is located on P2 level of the parking deck at the corner of Market Street and 19th Street, next to stairwell #4. The box office and the gates open an hour before matches start each day. You can view the hours via the online schedule at www.bbtatlantaopen.com. It is recommended to check out the tournament map via the new BB&T Atlanta app for additional guidance. It is recommend to check out the tournament map via the new BB&T Atlanta app for additional guidance. 6. What access do I get with my ticket? Your level of access depends on the type of ticket you purchased. All tickets provide access to our two courts: Stadium Court and the AJC Grandstand Court. Stadium Court is assigned seating, while the AJC Grandstand Court is general admission / first come-first served. Everyone is welcome to visit the food court and retail shop. VIP ticket holders have access to various VIP amenities, such as the Lexus Lounge and Champions Club, depending on the type of ticket access that was purchased. Please check out the tournament map for additional details on ticket access. Players can also be viewed on the practice courts by anyone; tickets are not required to view the practice areas. The practice courts have been moved to Block C this year. All courts are located within Atlantic Station. If you have any questions about where your seats are located, we have friendly staff stationed all around the tournament site to assist you. 7. Where are the restrooms located? Restrooms are located behind the Cigna Stadium Club at Stadium Court, next to the first aid area. 8. Where is the food court and what does it offer? The food court is located next to the main entrance and offers a variety of lunch, dinner, and snack options including shrimp salad, pulled pork, hamburgers and hotdogs, strawberries and cream, and gourmet cheese plates, along with an assortment of cool refreshments, including waters, Coke products, and alcoholic beverages. Drinks and light snacks are also available via food and beverage carts throughout the site. 9. Tell me about the cocktails. We offer a variety of alcoholic beverages, including Goose Island and Michelob Ultra beer, Ketel One specialty cocktails, and frozen drinks, to name a few. 10. What items are available via the retail store? We are very excited this year to unveil all new high-end logo apparel and headwear, for the entire family, including shirts, hats, towels, and cute captain’s gifts. And while your’re there, you can check out Mizuno’s hottest merchanize. 11. What comforts are available via the VIP areas? $$$ - The CIGNA Stadium Club tables are in a climate controlled chalet overlooking the Stadium Court with VIP food and beverage options. $$ - Goose Island suites offer great tennis viewing from a covered air suite with a private bar in the suite with all-inclusive beer, wine and soft drinks, along with VIP access to the air-conditioned Lexus Lounge. $$ - The Lexus Lounge Lexus Inner Circle seats not only provide access to the first row of the stadium, but they also offer the air-conditioned Lexus Lounge overlooking the AJC Grandstand Court, in addition to catering by The Giving Kitchen, which offers Atlanta's hottest restaurants and chefs. $ - For $20 ($25 at the box office), you can gain access to the new Champions Club, which offers private air-conditioned space overlooking our AJC Grandstand court, along with a cash bar and food offerings. Please visit www.bbtatlantaopen, select “Tickets” and then “VIP Entertainment” to view full details and to purchase. You may upgrade to one of the VIP areas at the box office, pending availability. 12. What are the best places to see players for autographs or photographs? During the tournament, autograph sessions are held for the public that will be announced via social media and our tournament website. Fans are welcome to line up after each match to catch players behind Stadium Court, in the main courtyard.